The last game I published for Zigurous was in 2015, then I became inactive with game development while focusing on other aspects of my life. It’s 2019 now, and I’ve finally started working on a new game; although, I don’t entirely know what it is yet. If you read our story, you know that I’m moving away from simple mobile and web games in order to create richer experiences where I can design worlds and tell stories around them. The balancing of good and evil within yourself is inspired in part by the Dark Souls universe as well as my own personal journey and newfound interest in psychology. Additionally, I really want to explore the use of primal elements, such as fire, water, and earth. This is inspired by a lot of fantasy lore, but the games that come to mind the most are Pokemon and RuneScape. I played these games a lot growing up, and there’s a simplicity to the game design I really appreciate. Despite the simplicity, there’s so many different ways you can combine the basic elements to create endless, multi-layered gameplay. I love games that allow people to express themselves in whatever way they want. Whether this is purely from the appearance of your character, or from choosing the type of class you want to play (e.g. melee, ranged, magic, etc), or even from combining elements to create more and more types of armor and weapons, this is at the heart of the games I love the most. Most RPG games embrace this kind of game design, which is my favorite genre and a genre I’ve always wanted to make games for. I don’t know that my next game is going to be an RPG primarily, but there certainly will be RPG elements to it — upgrading you character, becoming stronger over time, crafting new equipment, etc. I’m also interested in exploring the survival genre a little bit. More so in the way that Minecraft does — gathering resources, building a home-base you can be safe in at night, and crafting items and equipment to make you stronger and more efficient. Really, I’m most interested in being able to develop your own “base”. It’s almost like a tower defense game within a survival game environment. I’m not exactly sure what that’s going to look like, though. I have started developing a procedural generation system for the environment. I love the idea of a world that is always unique, always changing, but you always have a safe place to go back to. The next game I release will almost certainly be 3D instead of 2D like all of the other games I’ve made under Zigurous. 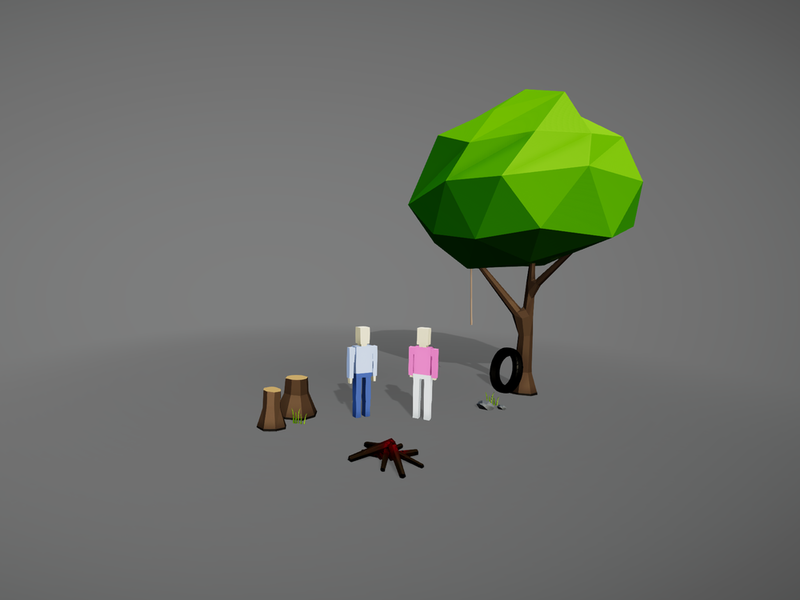 I enjoy creating 3D games a lot more; however, I’m better at creating 2D art. One art style I am comfortable with, though, is low-poly (like the above picture). The simple, geometric style fits perfectly with some of the other game design ideas I’ve mentioned, and it also allows me to put a large emphasis on color, the design element I love playing with the most. I think color alone can express so much emotion, and I plan on using color as a very important element to my next game. I’m a huge fan of abstract art, of which I think color plays a very important role. So that’s pretty much it! Right now I’m really just playing around with a bunch of different genres, design choices, and art styles, determining what I do and don’t like, and letting the game grow organically. My Unity project is currently called “Sandbox”, and I’m treating it as just that, a sandbox to play in. I’m building systems that will allow me to focus on the design. I will continue to share more details as I figure them out myself! Let me know what you’d be interested in seeing in the game.